HISTORY: As Bob's first carving, this figurine was sculpted with a nail and a screwdriver in his garage while he was still teaching school. Bob was looking for miniature figurines to put in his daughter's new doll house that he had just built. He either could not find the ones he wanted or could not afford them, so he decided to make his own. 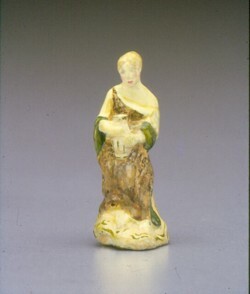 "Lady with an Urn" is a copy of a figurine (c. 1770) that Bob saw in a book he purchased about English porcelain and is one of a group of four depicting the "Continents." During a trip to London, England in February 1989, Bob visited the Victoria and Albert Museum and, for the first time, saw this figurine, "Moor with Spanish Horse" and the Meissen "Cherry Pickers." GENERAL: Bob carved this first wax, about 1-1/4 inches high, from the piece of wax given him by a dentist friend, Dr. Richard Ellis. In 1977 this was tiny for Bob! After carving for many hours, he took the figurine to a local jeweler, who made the mold and cast it. Bob took the rough bronze home to smooth it with his bench grinder, then primed it in white and began to paint his sculpture using a picture in a book as a guide. he used four different colors, so the owner could select a matching color to go with her doll house. He did not use glazes with these first pieces. They were painted opaquely. He was disappointed in this first effort because some details he had cut into the wax did not reproduce in the finished piece. He had not cut them deeply enough into the wax. The face had no detail and other cuts on the base did not reproduce. He even had to paint on the eyes in pink so that they could be seen. The figurine had the form of a lady in a dress, but generally was just rounded. It was stiffly done, and, as Bob lamented, "There was no one home inside." The important lesson here was that he could do something with this technique. There were also three more (free-standing type) cast in sterling silver - issue price and whereabouts unknown. SIGNED: These were all signed "R.O." on the bottom because his brush was too big to sign his name. STRONG POINTS: His first figurine to prove he could produce sculptures with this process. WEAK POINTS: Lack of detail due to not carving deeply enough, which was due to tool limitations and his lack of experience. VARIATIONS: Not enough made to have known variations. Lady With An Urn: The very first figurine that Bob carved was "The Lady with an Urn." He created the figurine froma picture in his art book using an 8-penny carpentry naila nd a screwdriver to carve the wax. Although "stifly" done, Bob learned that he could produce better figurines. These were signed "R.O." as the brush he used at the time was too large to sign "Olszewski" as he does today. Only ten of these figurines were produced: one brown; three green; three blue and three pink). Excerpt from Goebel Miniatures Newsletter Volume 1, Number 2 Summer/Fall 1986.